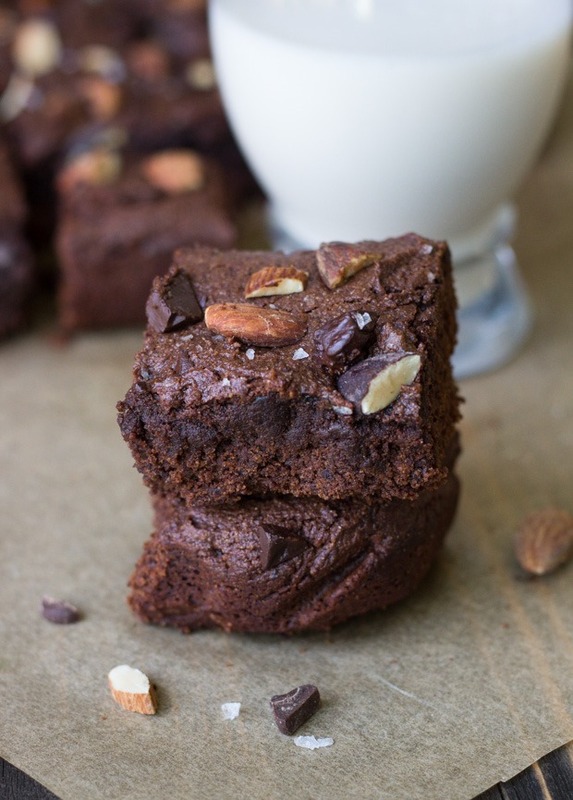 Rich almond butter brownies made with spelt flour and topped with dark chocolate, almonds and sea salt. So addicting you’d never guess that they’re vegan! Hello! I hope you all had a lovely weekend! Saturday was Brandon’s birthday so I made him his favorite dessert…rich chocolate brownies. Oh, that reminds me. I forgot to tell you guys that he got his car back! It had been sitting on the side of the road for three weeks until a couple that lived nearby finally reported it to the police department. Apparently whoever stole it just took it a for a joyride (to do who knows what) and then dumped it off. They took his CD player and possibly hit something because the alignment’s all out of whack but other than, the Green Machine is back in business! It’s a good thing too because after one day of riding his bike to work, he asked one of his coworkers if he could start giving him a ride. Sigh…now I just have to find some other way to force him to exercise. Not just any brownies though. 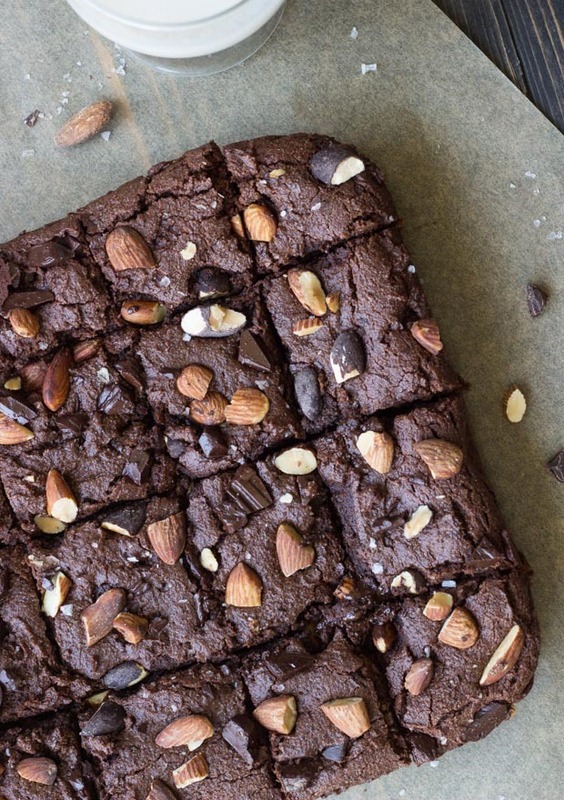 Almond butter brownies topped with dark chocolate, chopped almonds and sea salt, AKA the best combination EVER. 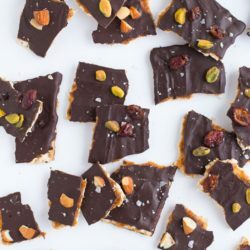 You guys, it took all I had to keep from the eating the entire two bags of Blue Diamond’s Dark Chocolate and Sea Salt Almonds before making these. They’re seriously addicting! On their own, they’re actually a sensible snack to satisfy your sweet tooth. 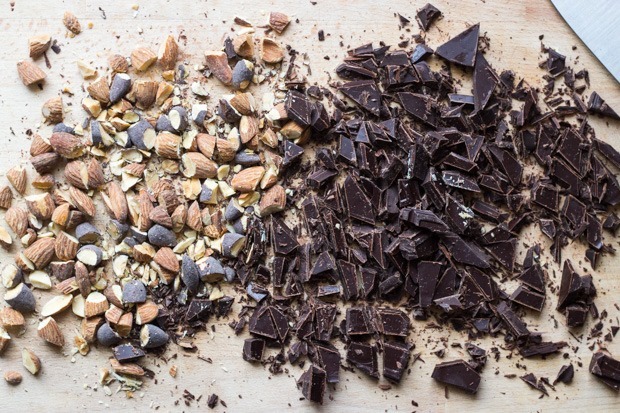 One serving of dark chocolate almonds (about 24 nuts) is only 160 calories, 4 grams of sugar, and 5 grams of protein. I was very impressed with those stats, considering how tasty they are. 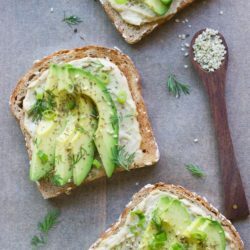 I use the word “trash” lightly here; the ingredient list for this recipe is actually quite wholesome. First of all, they’re made with whole grain spelt flour which is a great source of minerals, fiber and protein. 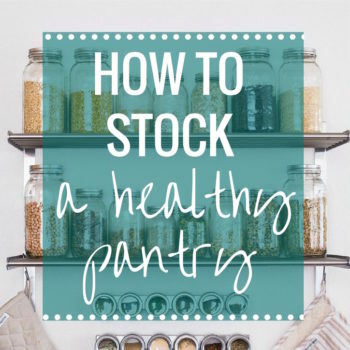 Spelt can be more easily digested than other forms of wheat making it a good option for those with wheat sensitivities, however, it’s not gluten-free. 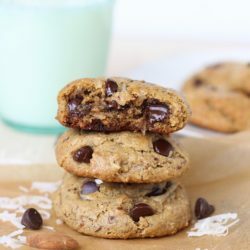 Second, they’re full of healthy fats from almond butter and coconut oil which give them a rich buttery flavor while keeping them dairy-free. And third, they’re naturally sweetened with dates, maple syrup, and just a little bit of organic cane sugar for delicious flavor that also packs in a little extra nutrition. The recipe is barely adapted from Amy Chaplin’s At Home in the Whole Food Kitchen by using a little less sugar and coconut oil in place of olive oil. I also under baked them slightly so that they would have more of a fudgy center, but the edges still have more of a cake-like texture to them. Bring 2 cups of water to a boil in a small saucepan then remove from the heat. Add the pitted dates to the saucepan and allow to soak for 20 minutes. Next preheat the oven to 350°F and line a 9 x 9” (or a 13 x 9”) pan with parchment paper. Combine the spelt flour, cocoa powder and baking powder in a large bowl and sift together. 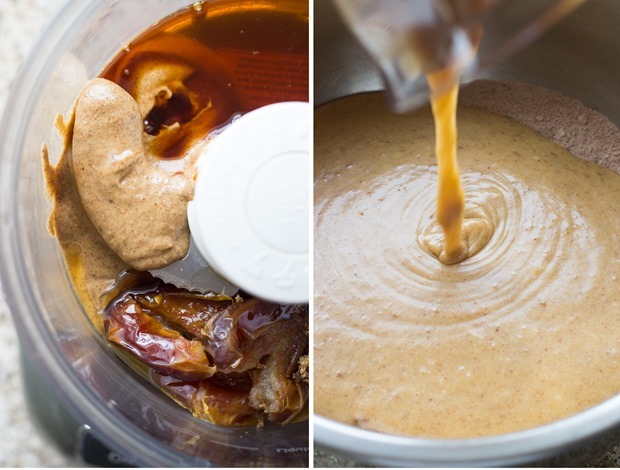 Once the dates are done soaking, transfer them to a food processor along with the almond butter, maple syrup, sugar, almond milk, vanilla extract, and salt. Add the melted coconut oil last then blend on high until smooth. Pour the liquid mixture into the bowl with the dry then use a rubber spatula to gently combine. Reserve 2 tablespoons of the chopped chocolate for topping and then gently fold the rest into the batter. Transfer the batter to the prepared pan and spread it out evenly. Top with chopped almonds and remaining chocolate then bake in the oven for 25 minutes. This will leave them slightly under baked for a fudgy center. Allow the brownies to cool completely before cutting. For best results, refrigerate for 30 minutes to an hour before cutting. This helps them hold together better. Store in an airtight container for up to 3 days. This post is sponsored by Blue Diamond Almonds but all opinions and text are my own. Thank you for supporting this site and the brands that help make it possible! Happy belated birthday to Brandon! These brownies look like the most marvelous birthday treat – I’d always prefer brownies over cake. Whenever I made vegan brownies, the middle sinks in and the sides burn, so I’m so amazed by how nice and fluffy these look! I’ll take 20 with a side of those tasty nuts! P.S. I’m so happy Brandon got his car back! I think I’m going to make these for a wine tasting dinner party I’m going to in two weeks. 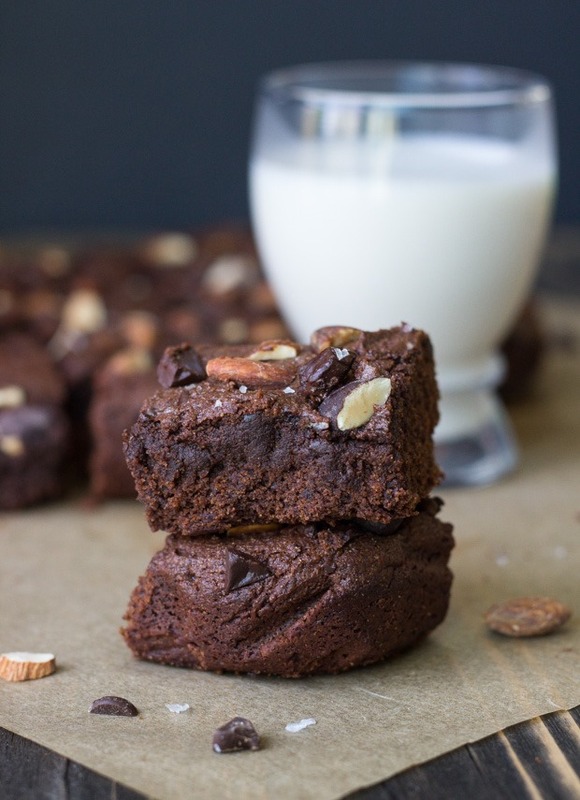 It’ll be fun to see what wine pairs well with these healthier brownies. :) I’m not big on vanilla almond milk though. If I use regular do you think I should add a little more sugar or will it be fine? I think they’d pair very nicely with a red wine. 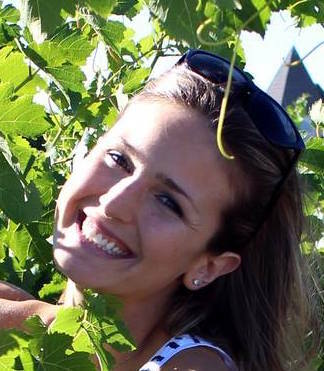 ;) We actually had a really tasty one called Meritage by Terra Savia (based out of Mendocino County). I found it at Whole Foods and we both loved it! And I think using regular almond milk would be fine. The original recipe calls for an additional 1/4 cup sugar (maple sugar, specifically- I used organic cane sugar) but Brandon and I are used to eating things that aren’t overly sugary so they were sweet enough for us. However for serving a crowd, it might be better to include the additional sugar. I hope that helps! 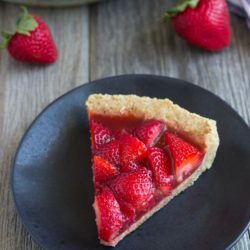 I didn’t even need to see the pics of these to convince me to make them, the title alone had me drooling! Holy yum. Creative recipe — these look decadent, yet are filled with healthy ingredients! I am gonna use the excuse that we eat with our eyes – in case anyone asks me why there’s drool on my screen! 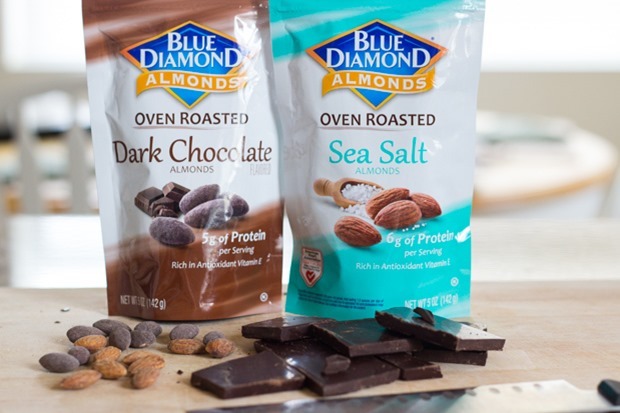 These look AH-MAZING – what a mouthwatering use of Blue Diamond Dark Chocolate Almonds and Blue Diamond Dark Sea Salt Almonds! That’s so awesome about Brandon getting his car back! Happy belated birthday to him :) And uhm… can we talk about how amazing these brownies are?! Because I can’t think of a single thing that I don’t LOVE about them… except maybe that there isn’t a pan of them sitting in front of me. But the ingredients in these are amazing, and they look so fudgy that I could just die. Ugh. Drooling. Wahoo for hubby getting his car back!! These brownies look like the most PERF celebratory treat. I’m with ya on barely being able to not chow down on the whole bad…the dark chocolate ones are a foodgasm all by their lonesome. Totally making these and not sharing them!! These look amazing, Sarah! 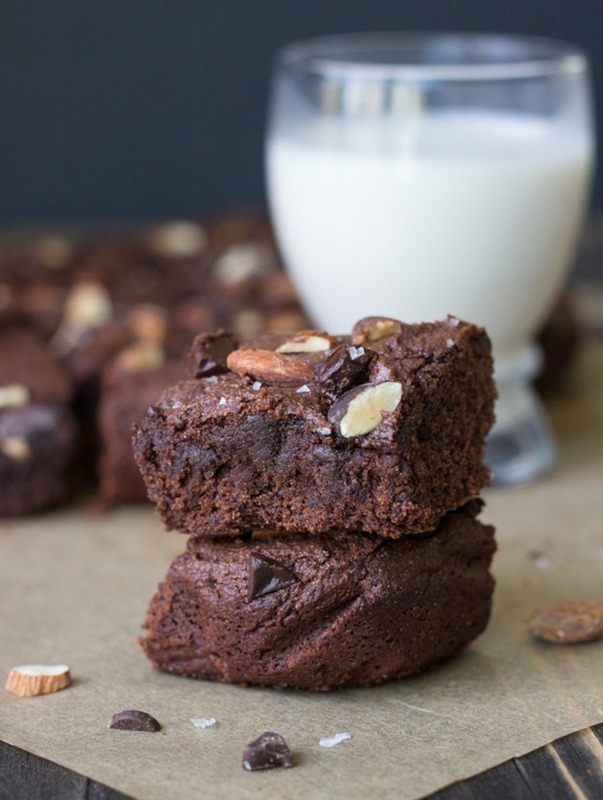 I love brownies but have never made a vegan version. I love how you have used dates as a natural sweetener – I’m a bit obsessed with them. I am so sorry that Brandon’s car was stolen, but that’s great he got it back! Someone vandalized my car recently – what is with these people?! Thanks for the brownie inspiration! Oh no, I’m so sorry to hear about your car! I hope insurance helps! Wow! I am in awe of the beauty of these brownies! I’m in complete food heaven. I love chocolate, so these sound like the perfect treat for me. I will definitely have to try making them! Well these look too good to be true! Oooh! A few things to say about this post: 1.) I’m on a conference call getting hungry and thinking about lunch, and then I see your IG picture of these brownies and I’m drooooooling. 2.) I’ve been munching on these almonds too and I LOVE the cocoa ones, and 3.) I can’t believe that about your hubby’s car! Sometimes I just don’t get what people are thinking, but I’m glad that you guys got it back. Brownies are literally my favorite dessert ever! Everything about the looks amazing. I love how fudge and moist they look too! Happy belated birthday to Brandon!! And how awesome that he got his car back! Although so weird to take a car for a joy ride and to steal like two things! Happy belated birthday to Brandon! This looks too good to be true!! 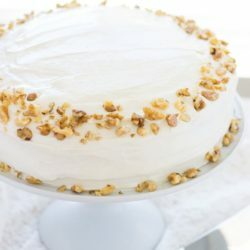 You are killing it with your baking recipes lately! I want to make all of them, but especially these. Love that you used dates in them! Also woohoo about Brandon’s car! The same thing happened to me a few years ago – I had a Cuisinart bread machine stolen out of my car in my apartment parking lot, then the apartment manager found it a few hours later in the corner of the parking garage lol. Guess some thieves just don’t have the balls to go through with it! Pingback: . link love 5/17 . - . running with spoons . Hi Jeri! I can’t say that coconut flour would work as I haven’t tried it. Coconut flour is very difficult to work with and usually requires a lot eggs so I don’t think it would work well in this recipe, unfortunately. You might try a mixture of oat flour and almond meal though! That would probably work better. I’ve been trying to find the recipe for HEATHY VEGAN RED VELVET CUP CAKES on Instagram February 6th. Could you please help. My daughter is unable to eat anything with eggs and Red velvet is her all time favourite. Look forward to hearing from you. Thank you.